Last week we examined the bullish symmetrical triangle pattern in gold and identified the potential breakout points in this time-tested technical indicator. We also looked at the Ichimoku Kinko Hyo indicators for gold to see if their trend and momentum signals confirmed the validity of the chart pattern. Were these indicators correct? Well, time will tell, but there are signs that the price of gold has broken out from consolidation, and may be poised for a move up. Let's see what's been going on with gold. Here is the symmetric triangle pattern we identified last week. With it, we identified breakout prices of 1612 on the upside and 1559 on the downside. This week spot gold prices broke through 1612 on the upper trend line. So does that mean we are on our way up? As my market making Zen master always told me, "We'll see." His words never seemed to satisfy my need for proof of any premise. Here's a chart as of yesterday's close. Gold began its move up after the printing a hammer candlestick on July 24th. After strong upward trading the next day, price action broke through the upper trend line on July 26th, closing at 1614. The spot gold price continued higher last Friday. Trading volume was significantly higher during the bullish trading sessions. As we know, symmetrical triangle patterns can signal continuation of the preceding trend, or a reversal. That's why some regard symmetrical triangle patterns as neutral patterns. In the case of gold, continuation would mean a move to the upside. A reversal would indicate the start of an intermediate trend to the downside. It is important then, to confirm the validity of any breakout. According to conventional analysts, such as Edwards and Magee, a breakout pattern is invalid unless accompanied by significant increase in trading volume. As indicated in the dark oval in the chart above, trading volume was significantly higher during the bullish trading sessions. Well, wouldn't that confirm we have a valid breakout? We'll see, says the Zen Master. Here's why. Yesterday's volume was down. And, price action produced a solid hammer candlestick, indicating a tug-of-war between buyers and sellers that ended on the sell side. So the validity of the bullish breakout from the symmetric triangle pattern is not proved by volume beyond a shadow of a doubt. Nothing in life, much less in trading commodities is certain. So we'll stick to the preponderance of the evidence here. Again, we rely on the Ichimoku and other technical indicators to give us more evidence of what's happening with gold. 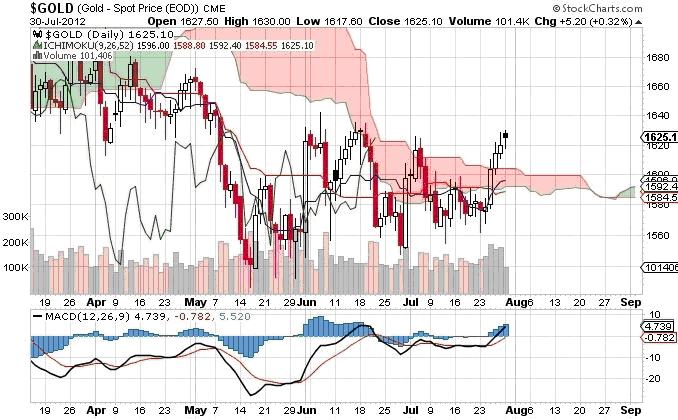 It's clear from the daily Ichimoku chart that gold has broken through resistance, and is now trading above the cloud. And the projected cloud has turned bullish (now shaded green). The Tenkan Sen made a bullish cross of the Kijun Sen from below on July 26th. These are all bullish indicators. The Chikou Span (green line), has moved above price action, which is bullish, but is now in neutral territory (in the cloud). Were the Chikou Span to drift higher or sideways, then all Ichimoku indicators would signal a strong buy for gold. The separate MACD oscillator made a bullish cross ahead of the Tenkan Sen bullish cross, as is typical for the this "predictor" indicator. Support is now 1604, with first resistance at 1642, then 1665. Edwards and Magee may prove right once again that increased volume confirms a breakout from a symmetric triangle pattern. I think price action provides the best confirmation. And we will see shortly if the price of gold can withstand another bout with the fantastic FOMC later this week.